A representative of Far and Wild Safaris will collect you after your breakfast from your overnight accommodation in Durban or from the King Shaka International Airport and travel along the scenic Dolphin Coast and into rural Zululand, directly to the "big 5" Hluhluwe uMfolozi Park where we would spend two nights at Hilltop Camp. The accommodation here is in a brick under thatch chalet, each bedroom with its own private bathroom/wash-basin and toilet. Each chalet is also equipped with a fridge. After breakfast we do a further game drive in the Hluhluwe iMfolozi Park as we exit the park to arrive at Makakatana Bay Lodge in time for lunch. This luxurious lodge is set on the western shores of Lake St. Lucia and is the only privately owned lodge on the western shores. This afternoon we go on a game drive after tea in a 4x4 open safari vehicle to the heart of the Wetland Park. There will be another game drive into the Wetland Park before breakfast at Makakatana, and after breakfast we make our way to the nearby Private Game Reserve, arriving in time for lunch. 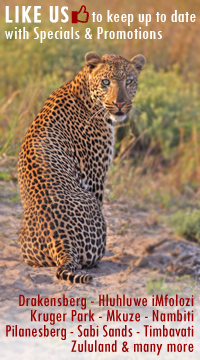 Over a late afternoon tea, our ranger will discuss what you hope to see during the afternoon game drive. This game begins in the late afternoon and lasts until after dark, when spotlights are used for a glimpse into the nocturnal bush life. Listen to lions roar in the dark or admire the small nocturnal animals. As dawn breaks over the African bush, a gentle tap on your door will wake you to the delights of a new day. Your ranger will discuss what you hope to see that day over fragrant tea or coffee and morning biscuits or rusks. Return to your lodge for a delicious breakfast.